If you’re looking for an alternative to concrete paving for your home, liquid limestone is the best way to go. 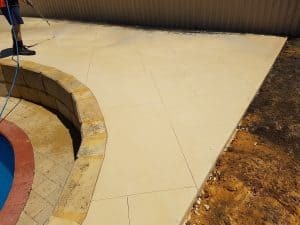 It’s becoming a popular option in Perth and there’s an endless list of why this choice is better than pavers. Skyle specializes in production and application of liquid limestone, both for residential and commercial purposes. But why exactly would you want liquid limestone for your home? Low Maintenance – the materials that we use are high quality and are resistant to cracking and spitting. Affordable compared to exposed aggregate we can customize the limestone quantity and composition to meet your budget requirements. 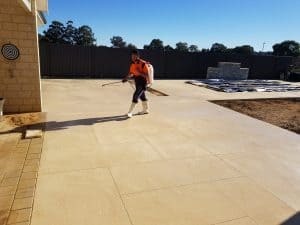 Customisable – we can vary the liquid limestone composition to match your home’s surroundings and make it visually appealing. By mixing it with exposed aggregates, we’ll be able to customize the patterns and colours to suit your taste. Our team’s combined years of experience in liquid limestone application makes us one of the experts and the name to trust in the industry. 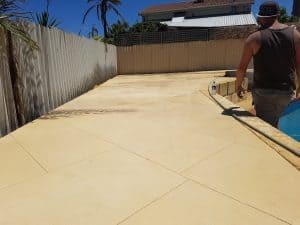 We know what to expect with every project we do, and how to prevent and rectify any possible issues associated with liquid limestone application. Here at Skyle, our goal is to always deliver first-class and high quality results, and there’s not a project too difficult for us to handle. Liquid limestone is not actually concrete, but it is very similar. However, there is one minor difference. During the summer, concrete can get really hot. Liquid limestone will not heat up in the summer. This makes it best for a few key applications. For instance, liquid limestone would be an excellent choice for locations that will be walked on without any shoes. This would include around pools and in backyard areas. It is also suitable for driveways, Alfresco areas, porches and footpaths. 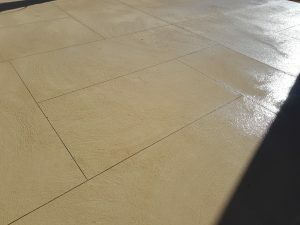 You can also choose from an assortment of patterns and designs to be cut into the liquid limestone.